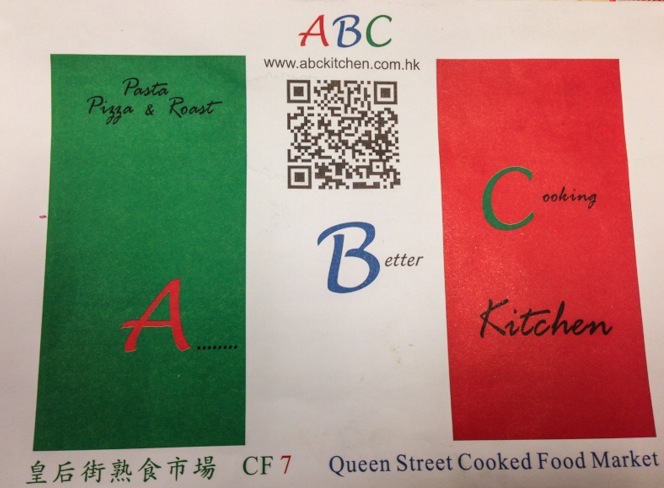 It has taken me such a long time to visit this famous place – I’ve almost lived three years in Hong Kong and just a few weeks ago it was my first visit to the ABC Kitchen (and I had read so much about it here, here and here). Needless to say that I have been back since… and only ten days had passed between my first and second visit. ABC Kitchen – the acronym for A Better Cooking Kitchen – is run by two former chefs from what used to be M at the Fringe. It is said that they have brought their most popular dishes to ABC, where they continue to be just as popular. ABC Kitchen really is a unique experience. 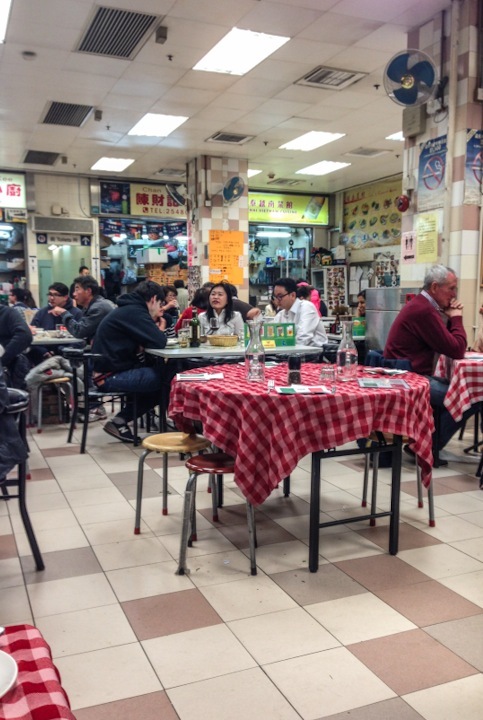 The restaurant is tucked away on the second floor of a cooked food centre (to be precise: in the Queen Street Cooked Food Market in Sheung Wan), next to a Beijing dumpling and an Indian place (I’ve heard that the Indian food is very good there too, but I’ve not yet tried it). It is the only restaurant with a proper table cloth in the food court – looking like a French bistro or Italian restaurant, which it is neither. It is a place where heart-warming, authentic Western food is cooked – where waiters take pride in their service – where the menu is small and the ingredients are fresh – where you have to leave room for dessert in your stomach! But let’s start right at the beginning. If you want to have a table for dinner for more than 2 people and it is between 7-9pm, then you should book. Just call in advance to make sure a table is reserved for you. Once you arrive, you’ll be seated, fresh and warm bread will be served – and the waiter will tell you the soup of the day and where the oysters are coming from. 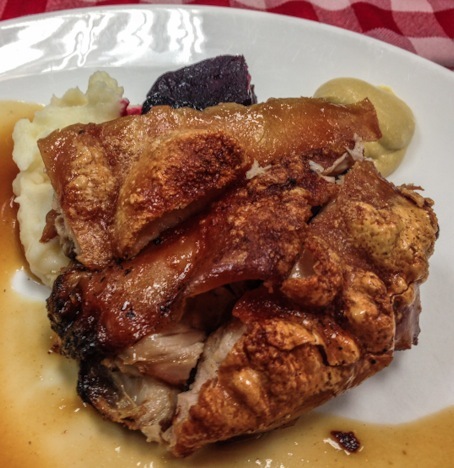 The menu changes regularly, but the signature dish, the suckling pig should always be there! We started off with the soup of the day (33 HKD) – which was carrot soup. It was hot and very tasty. A little bit too creamy, but that might be my personal taste. Then, we had the suckling pig (168 HKD). 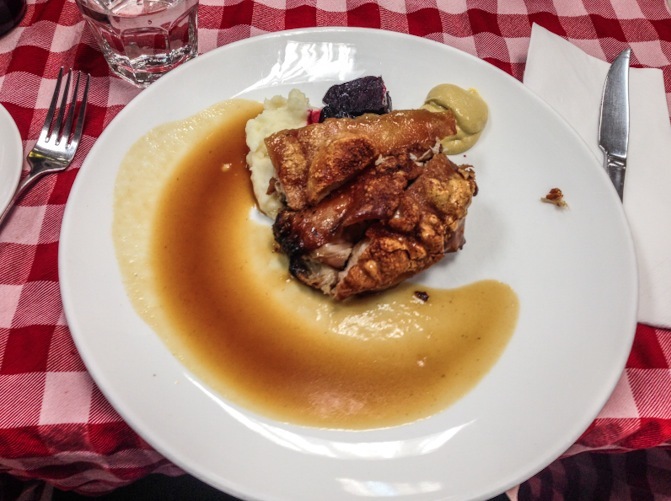 The skin was crispy and the meat was juicy, rich and served with creamy potato mash, beet root and a spoonful of tasty mustard. It’s just a shame that the portion size is normal – I could have eaten a large one easily, it was so yummy! For desserts, we tried the creme brulee (42 HKD – nice) and the pavlova with fruit (58 HKD – fantastic! It is very sweet but the sour fruits including passion fruit balance the sugars nicely). We saw other diners eating the chocolate sufflee and they seemed to enjoy it too, so that’s on the list for next time! One thing to note about ABC Kitchen is that although it is situated amongst dai pai dongs, the prices are by no means dai pai dong prices. We usually pay around 300 HKD per head, if we eat 2-3 courses and drink a glass of wine or beer. Still, it is very reasonable for this unique experience. Will I go there again? Yes, I’ve been twice already and I’m sure I could easily become a regular for good food at affordable prices, with attentive service in a quirky location.